And I was still blocked by the OP without a single response. I don’t think that people who say these things want any discussion. I think their goal is to start arguments, and silence anyone who tries to actually show reason and sense. I haven’t been on tumblr long, but I have seen a lot of moral posturing disguised as productive discourse. It’s disgusting to me, as a bisexual, that these people are using social justice as a vehicle for plain old rudeness. If you want to make fun of us, just do that. Don’t dress it up behind LGBTQ rights. This is concern-trolling and nothing but. That anyone would use a minority group as a smokescreen for this is childish and inappropriate. Next time you wonder why otherkin aren’t polite to you all the time, remember things like this. Remember that no matter how nice and patient we are, we know that most of you are more concerned with your public images, and being know-it-alls, than being truthful or fair. And statements like these, over 95% of the time are trying to disarm you to maximize their trolling. I may sound jaded but this is experience speaking from over a decade of being part and running my own otherkin communities. The people who are misrepresenting our community by claiming to be part of it and representing it, are the same deal without the effort of getting into the community in the first place. Remember folks, anyone can post anything and put it in whatever tag they feel like. None of these people are interested in an actual debate or discourse about these issues, they just want to smack bees nests without getting stung. Almost noone is going to come to us with the intention of listening to us explain what we are and how and why we exist, and have an open mind in doing so. Humans have an innate need to see themselves as above other humans, so they come to communities like ours to “people watch”, which is to say, see people they can justify to themselves are “not as good” as they are. They are going to troll you, to try to break you down with the same tired arguments which have been answered for decades, to call you crazy, deluded, to tell you to “get help”, etc. Its all for their own self-esteem because they haven’t dragged themselves out of their basements yet and made something, anything of their own lives. There are extremely rare exceptions but good luck finding them amongst the trash. There is no verb form of “kin”. You cannot “kin with something”, and “kinning” is not a thing. The question of whether or not it’s “okay to kin with that” should never even be asked, because it’s not possible to “kin with that” in the first place. You either are a thing or you are not. It is involuntary. Ask instead (at all times) whether or not your words and actions at any given moment may be harmful to anyone else. Otherkin is who and what we are, not something we do. It is not an action because it is not a choice. And if you are “kin with” something that means you are their relative. I am not “kin with” dragons. I am a dragon. I am kin with my cousin. How very eloquent. You have a real gift. Rarely have I seen such marvelous command of the English language, such clever and creative prose. How can I possibly disagree after you’ve so thoroughly proven your point? Truly I have seen the error of my ways. You don’t at all sound like an angry Tumblrkin with no argument at all who stoops to ham handed personal attacks because you’re enraged at being called out for something you know is true. Well done. Now if anyone has anything intelligent to say I’d be happy to have an actual discussion about the topic. I’d DM this person if they hadn’t blocked me to avoid hearing my response. 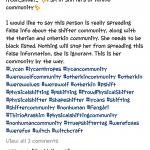 I haven’t been a part of otherkin communities for a long time. (Much suppression on my part.) What I’ve seen on tumblr so far has me really dumbfounded. Do real gatherings and conversations happen anymore? Yes. You just have to know where to look. There’s a list of good blogs in my FAQ somewhere or other. I think it’s in the otherkin masterpost. These people who think you see something and then “kin with it” have absolutely no idea what being otherkin is. 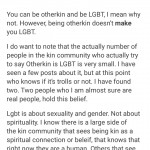 You are born otherkin, it is something that is a life affector, not a life choice. The process of discovering what you are is part of a life path, and very often its one you instinctually know you’re on before you even know there is a word for it. 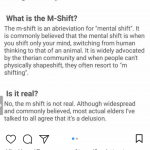 I am not saying its impossible that you can’t become otherkin during your life, but this whole thing about “kinning with X” is outside the definition of otherkin. You will feel your kintype from within, not get it from an external source. What you are is part of you, it can’t choose you and you can’t choose it, you can only discover it as a part of what you are. TL;DR Tumblr/Internet PLEASE stop equating “otherkin” with “permission to take on X identity as a persona”. You aren’t getting it. If you really feel you “identify as something”, then take the time to stop and figure out why, and when you have, THEN come out as otherkin. You owe this introspection mostly to yourself, to thine own self be true, if not to anyone else. I guess before Pride Month is over I should post some bisexual art. Of myself. 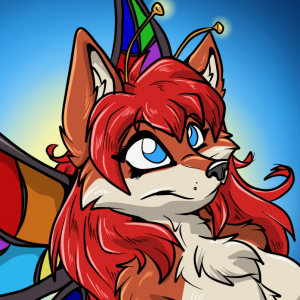 Something I noticed that was very prevalent in Lupa’s Field Guide to Otherkin that I don’t often see talked about in the community was the notion that one could identify as kin on multiple levels. 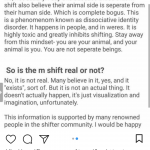 Just because you believe you are spiritually kin (through reincarnation, walk-ins, etc.) doesn’t mean you can’t look at yourself through a psychological lens as well. I’ve personally found said advice very helpful and reassuring, as I feel I am spiritually-based but also find a lot of parallels and possible dragon influences on my psyche through my upbringing, but always felt like I was betraying my beliefs by entertaining psychological notions while believing I had a spiritual origin. I’ve also noticed that she relies heavily on Jungian psychology to explain some other types of being ‘kin that are no longer talked about in the community – for example, the idea of being kin through a personal mythology origin, an archetype, an energetic resonance, etc. I recommend doing some research into this area for anyone still searching to find a possible origin..
Yessss, I’m really not a huge fan of the psychological/spiritual dichonomy, the whole this OR that thing. Why not both? Or neither? And the idea of personal mythology in regards to non-human identity is really intriguing to me and something I’d love to see talked about more. Lupa wrote these two posts (here and here) about just that and it’s a good read. I personally believe that kinness has both spiritual and psychological aspects, at least it does for me, but I know how they got separated in the community. Both sides wanted to feel more valid than the other. I can’t make heads or tails of who is saying what in this post but I’m just going to say this, from personal experience. Also, I don’t have a human side. Rereading this over and over and I still can’t make sense of it..